Segmental reporting is the process of reporting the activities of profit centers such as divisions, product lines, or sales territories. The contribution approach is valuable for segmented reporting because it emphasizes the cost behavior patterns and the controllability of costs that are generally useful for the profitability analysis of various segments of an organization. Fixed costs are much less controllable than variable costs. Direct fixed costs and common fixed costs must be clearly distinguished. Direct fixed costs are those fixed costs that can be identified directly with a particular segment of an organization, whereas common fixed costs are those costs that cannot be identified directly with the segment. Common fixed costs should be clearly identified as unallocated in the contribution income statement by segments. Any attempt to allocate these types of costs, on some arbitrary basis, to the segments of the organization can destroy the value of responsibility accounting. It would lead to unfair evaluation of performance and misleading managerial decisions. 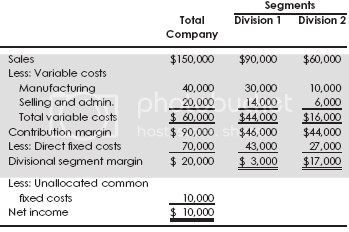 Net income – Segment margin less unallocated common fixed costs. Segmental reporting can be made by division, product or product line, sales territory, service center, salesperson, store or branch office, or domestic or foreign operations. 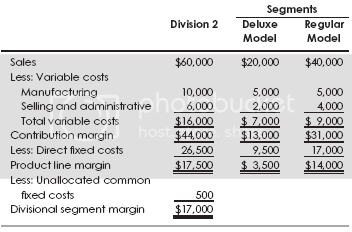 The segment margin is the best measure of the profitability of a segment. Unallocated fixed costs are common to the segments being evaluated and should be left unallocated in order not to distort the performance results of segments.